I didn’t know such things existed in the blogging community, BUT…. 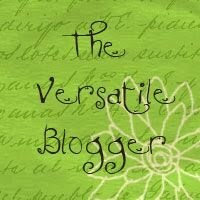 I received my very first blog award this week!!! A HUGE thank you to Eliz for passing this my way… you are such a kind heart, my dear! 🙂 Elizabeth’s blog, Mirth and Motivation was one of the first I stumbled upon when I began exploring other’s blogs. I found her words to be so inspirational and her feedback and support since our first interactions have been so awesome… She’s an original, inspirational soul with the kindest of hearts. Please be sure to stop by and pay her a visit! 3. Pass the award on to 15 new found bloggers. 2.) 7 Random facts about myself…. Hmmmm, could be tricky since I posted the 100 pieces about me crossing of an item from the list but I’ll give it a shot! I LoVe my Sonicare toothbrush… Money well spent. Seriously, contemplating cancelling my cable service. Most of what I watch, I catch on Hulu in my spare time which is free. Just have to bite the bullet and work up the nerve to really do it instead of thinking about it! It’s save me some money, why wait? The first car I ever drove was a Maroon Plymouth Horizon, then a Dodge Shadow. First car ever owned was a bright red, 2 door Geo Metro Hatchback. It was the BEST car ever!!! Getting me to and from Edinboro and Maryland. Was a very, very sad say when the roller skate got towed to the car cemetery. I even cried when it got towed! Another little tidbit about my cars… all but the new car I purchased in 2010 were a shade of red! Strangest thing I’ve ever eaten… Don’t judge me people, I was too young to know any better AND was under the influence of my pap, a hunter and lover of wild game and other oddities. Ok… Here goes. LAMB’S TONGUE! I don’t remember it at all. I’m just going off the word of my mom. She said I gobbled it all up. I’m guessing as soon as I was old enough to realize I never touched it again, because quite honestly the thought of it makes me wanna be sick! My favorite stores are Joann Fabrics, Michaels, Borders/Barnes and Nobles and Target. Could spend hours in each respectively and pretty much have on a number of occasions. The last time I was at Joann’s I was on a mission to find fabric for a tote a student’s parent was going to make for me… Mandy and I were in there for EVER!!! 3.) I get to choose my favorites!!! Not a difficult thing to do since I look forward to reading what these lovely people have to say each and everyday! I seriously get excited when I get a gmail notification that one of my bloggin’ buddies has a new post. And I give you “The Best of What’s Around” in my blogging community…. Reminiscing Via the Written Language Great tidbits of everyday going ons, Proud papa to his 3 kiddos and a determined and driven soul… plus I think Rick enjoys music just as much as I do! Simple Moments-Living Life to the Fullest The VERY FIRST blog I subscribed to on WordPress. Nicole’s gift of appreciating all the simple moments in life is what got me hooked. She’s so grounded and down-to earth… just great! Tinkerbelle86’s Blog HILARIOUS!!!! I think this gal and I may be long-lost sister’s or something… already dubbing ourselves music twins. Cut and dry, hands-down, tearing up funny Laura is. This Italian Family Who doesn’t love Rach’s posts? A daily breath of fresh air delivered to my inbox, never-failing to bring a smile to my face! Sweet, happy and lovin’ life… that’s Rach. Plus, the recipes she posts look AMAZING! Little Miss Everything Her blog title says it all… She posts about anything and everything… We see eye to eye on pretty much everything, so of course I love her blog. Plus we’re both waiting for our Princes to find their way aren’t we Vic? Devastating the Obvious Relatively new to the blogging arena, yet tearing it down from the get go… Real and to the point posts that get ya thinking… undeniable humor and whit that make ya chuckle even when he had Blogstipation. Great reads Josiah… glad I stumbled upon your blog. Diary of a Scatterbrain So happy to have found this blog via Rick’s… All I heard was Blog Book Club and I was in! Plus I was super excited to learn we’ll be reading The Last Lecture which you all know I love, love, love! I don’t see much of a scatter brain, but a fun-loving, spunky gal in Caitlin! Something New Please Love, love, love the short stories shared… Something so very mysterious. Nice work D! Keep ’em coming! Melissa’s Meanderings My most favorite posts of Melissa’s are Thankful Thursdays…. So very important to take the time and acknowledge all that we are blessed with in the day-to-day. Even though I was annoyed with the snowflakes falling yesterday morning, she made me appreciate them through her post. So there you have it…. Yes, I know there are only 9, not 15 but these are the ones I wanted to share the award with… Don’t be sad if I missed you… So hard to choose and don’t wanna leave anyone out SO…. go ahead! Take the award! It’s your for the running. Of course Eliz would be on this list had she not been the one to pass the “award” on to me. Three new finds I’d like to share with you are A Pinch & A Dash, The Lunchbox Diaries and Unscripted Thoughts. Check ’em out… you may find something you like! 4.) I’ll be letting each of you know I’ve passed this along just in case you don’t happen to see it here on your own! Off to the bed I go… This girl’s sick. Got a fun case of the icks and yucks! BLAH. I’m flattered and honored! Thanks for thinking of me. Wow thanks, I accpet and will post it now! You are very welcome chica! Thanks S and you’re welcome! Loves to you too ❤ Yes, chat soon… maybe tomorrow. I told ya not to judge!!! I didn't know any better… my pap LOVED them. YUCK!!!! He also liked pig's feet and pickled herring. Double YUCK! I received my first…and I think only blog award sometime last year. That was before I became a bad blogger and left my blog for about 3 months. Congrats on the award. Thank you SO much!! I accept and will post my response in the next day or two!!! 🙂 You’re the best!